The power of simplicity is on full display here. Jake Owen’s new single is a powerful ballad because it’s not a power ballad. He pairs an intimate and quite painful lyrics with a piano and subtle backing vocals. That’s it. He trusts the song and his ability to deliver it without anything else getting in the way. His confidence is well founded. Though the song starts a bit too slowly, it develops into a fully realized performance that’s as good as anything I’ve heard this year from a radio artist. Nice to see a major label actually release the best song from an album. Hopefully it gets enough support to be a hit. Might be the best single released this year by a big mainstream artist. I sure hope it’s a hit. Country music needs these kinds of songs and they’ve been missing way too long. In all seriousness though, this really is a good song and it reminds me that Jake Owen really does have a great voice. Was *really* hoping for “Ghost Town” (almost certain it’ll be single #4) but this is still a great song. I agree with Leeann that it showcases his great (and underrated) voice. LOVE THIS. I’m with Ignatius, best mainstream single so far this year. The slow start didn’t bother me but i didn’t care for the first two verses lyrically, the greener grass, faster cars, bigger houses, etc. Overall, very good song and performance by Jake. Got a kick out of the masterpiece provided by Leeann. I can’t speak for him, but I wonder if that’s what Kevin meant by the slow start, Bob? Does anyone know who is singing the backround vocal? It definitely positively adds to the song. 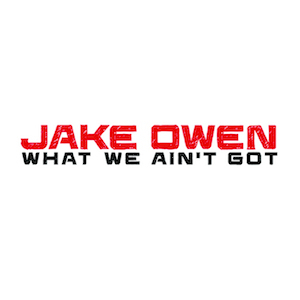 But they don’t know the Jake Owen I know and love — the guy … this side of him on the radio once his latest single, “What We Ain’t Got,” … Owen is backed by piano, some steel guitar and Sarah Buxton on background vocals. She’s does a more prominent vocal on Dierks Bentley’s “Sweet and Wild.” I’m used to her voice sounding more earthy/rough than what I’m hearing on this song. the song itself is wonderful & Jake does give what is probably his strongest vocal of any release to date! However I just cant get too excited about his vocals on anything hes done so far (especially his ballads) & this one is no exception. I have to give this one a solid B & personally think that the two songs reviewed today would both be better if the other songs artist had recorded them..
…not exactly beachin’ anymore, this one. Any Jake Owen release is better than “Beachin”. Talk about a low tide of a song.